It’s been a long hard winter, so make plans to welcome spring this year at Carmel Valley’s East End Wine Row Spring Celebration. Slated for Sunday April 28th, from 1-5 p.m., the event will feature appetizers and wine tasting, live cooking demonstrations and garden tips from a Master Gardener. East End Wine Row is an association of Camel Valley tasting rooms located at 19 E. Carmel Valley Road in Carmel Valley Village. Wineries represented include Chesebro Wines, Cima Collina, Dawn’s Dream Winery, Holman Ranch, Joyce Vineyards and Parsonage Family Winery. Spring Celebration tickets are priced at $35, with $5 from each ticket going to VOICES of Monterey County, a non-profit child advocacy organization serving children in Monterey County’s Foster Care System. You must be 21 years old to purchase tickets, and space is limited, so get your tickets early. Tickets are available at participating winery websites, in the tasting rooms, or online at www.eastendwinerow.com/ . Access is good at East End Wine Row too, with accessible parking at both ends of the complex, and level or ramped access to all the tasting rooms. For best access to the sidewalk, use the ramp at the west side of the complex, as the one on the east side (near Dawn’s Dream Winery) is a little sweep. Just follow the signs. And if you can’t make this event, then be sure and check out some of the mini- events held by the various wineries throughout the year. For example, Cima Collina’s Tasting Room celebrates Friends Day, every Wednesday thru October 30, from 4:30 – 7:00 p.m. Enjoy a special flight selection or a glass of wine, and munch on free popcorn while you visit with friends and unwind. What could be better than a mid-week wine happy hour? 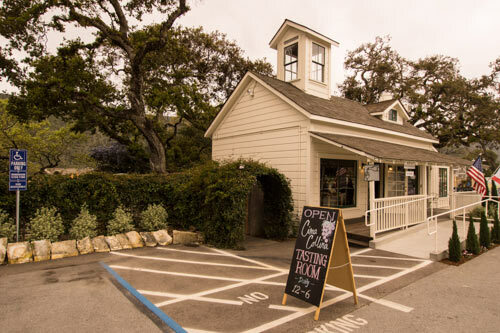 So make plans to visit Carmel Valley’s East End Wine Row today. And get you tickets soon for the Spring Celebration! This entry was posted in Events and tagged barrier-free, Carmel, cima Collina, East End Wine Row, event, food, garden, Spring Celebration, tasting, Valley, VOICES, wheelchair by Candy B. Harrington. Bookmark the permalink.